Thessaloniki is set to become the newest destination with bragging rights for independent travelers. Greece's second largest city is the gateway to Macedonia with connections to Alexander the Great and his tutor, Aristotle. Its two major universities—one of them even named after Aristotle—attract a large student population and with them youthful music, arts, and sports scene. And its restaurant and cafe culture are about as eclectic as you can get anywhere in Europe. But maybe the reason that this dynamic Greek city is finally popping up on adventurous travelers' radar is that it's easier to get to than ever before. A whole assortment of US and European airlines have one-stop flights from most major American and Canadian cities. And in 2017, UK budget airline easyjet added cheap direct flights to Thessaloniki from several UK airports including London Luton. If you can grab a budget flight to London, it's just a quick, cheap flight to Thessaloniki and you can say you've been somewhere most of your friends haven't visited yet—without having to climb the Eiger, sleep against a cliff face in a sling or canoe up the Zambezi. Reworks brings together an eclectic mix of music—from experimental sound to modern classical music and contemporary electronics. It's five days and nights of performances by well established and emerging artists from across Europe. The Street Mode Festival is a four-day celebration of live, street-based performances and visual arts. There's music, gigs, DJ sets, and MC competitions; graffiti and street art shows and competitions; street dance and street sports—parcour, freerunning, and BMX. Also, lots of side events and a children's program. Thessaloniki International Film Festival is a November celebration of the best in contemporary filmmaking with shows, forums, professional masterclasses, and discussions. Missed it at TriBeCa or Sundance? Catch up with it in Thessaloniki. The Dimitria Festival, a major cultural event in autumn combining art exhibitions, music, theater and dance performances, films, discussions, and workshops. Artists, performers, and experts gather from all over the world. Nightlife is one of the main reasons Thessaloniki should be on your 2018 hot list. Whether it's tavernas with live rembetika music or vast pulsating clubs, the party goes on into the wee hours in pockets of entertainment scattered around the city. , National Geographic recently named it one of the top ten cities in the world for nightlife, claiming more bars and cafes per capita than any other city in Europe. Try Mylos. It's a vast entertainment and nightlife space that was once a flour mill in the warehouse area of Port in the western part of the city. It's full of cafes and bars, music venues, concert, exhibition and performance spaces, and hundreds of milling revelers. It's where the Reworks Festival is usually based. Or check out what's happening at Fix, the​ Fix Factory of Sound, a live music venue that has concerts and club nights and a kind of mosh pit scene. For less hectic nightlife, stroll the restaurant and entertainment district of Ladadika where there are plenty of bars and cafes with music. And look for rembetika, the traditional, political blues music of Greece, in rembetadiko—small tavernas where musicians sit on the edge of the stage and perform while people eat and drink. Rembetika is the Portuguese Fado or the Canto Flamenco of Greece and these days it's the hipster's choice. Thessaloniki's great variety of informal dining and modern, irreverent interpretations of traditional dishes—at very reasonable prices—has recently won the city the title of Gastronomic Capital of Greece. Some districts are better than others for grazers and diners alike. Try Ladadika for lively bistros, island-inspired dishes, and a casual, young atmosphere. In the seafood and vegetarian heaven that is Greece, Palati is a good choice for meat eaters and there's usually bouzouki music to go with. Along the Port area, restaurants and cafes are a bit pricier, because of the seafront views. But the people watching here is great, so plan to at least have coffee or sunset drinks. And for a special, bust-the-budget blowout, try 7 Thalassas for very good seafood. For some of the best views and an ever-changing selection of little, family-run places, head uphill to the area known as Ano Poli (for Old Town) where you can dine overlooking the whole of the city and port, beside ancient castle walls, for as little as about €20 per person. Downhill from there, Tsinari Square has airy, open cafes and plenty of accomplished, modern variations on traditional mezethedes. 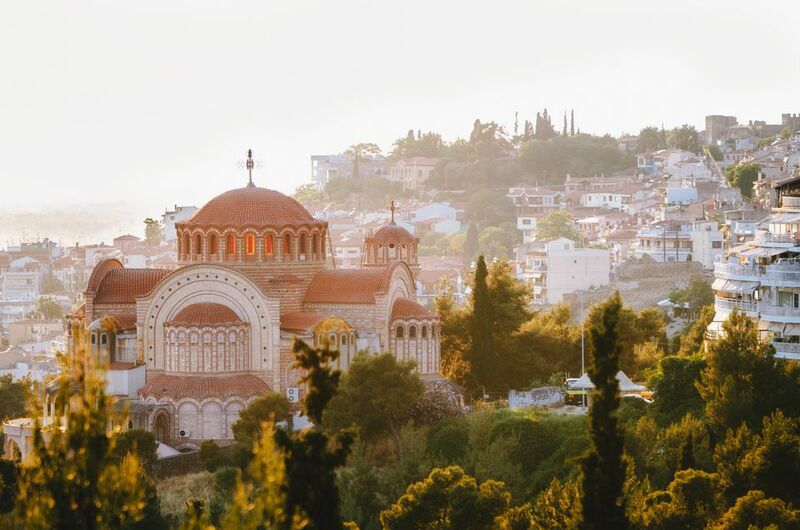 While in Thessaloniki, be on the lookout for Eastern European influenced dishes such as stuffed cabbage or piroshki and try to find the very local specialty known as trahana. It's cracked wheat or couscous dish served with yogurt or sour milk. Considering the city's location at the crossroads of European and Ottoman culture, you'd naturally expect Thessaloniki to have some terrific museums of ancient history. And the city does not disappoint. The Archaeological Museum of Thessaloniki, one of the largest museums in Greece, traces the civilization of Macedonia from pre-history to late antiquity and it's crammed with dazzling ancient treasures. The Museum of Byzantine Culture opened to much applause in the 1990s, is home to collections that cover the transformation of Roman religion and the early Christian Church to the 15th-century fall of Constantinople. The architecturally interesting Macedonian Museum of Contemporary Art. The Thessaloniki Museum of Photography, with regular and internationally relevant exhibitions and events. The small but interesting Cinema Museum and Film Collection, the only cinema museum in Greece and hub for the city's annual film festival. The Olympic Museum of Thessaloniki, the only museum of its kind officially recognized by the Olympic Committee. There's even a museum devoted to basketball, The ARIS Basketball Museum. Like most major cities in the Balkans, the built environment of Thessaloniki has suffered more than its fair share of war wounds. Much of the city has been built or rebuilt during the 20th and 21st centuries. But the evidence of ancient Byzantine and Ottoman architecture is dotted all around the city, each standing out like a gem in its modern setting. Some, like the White Tower, is prominent and important. The tower, which has become a symbol of Thessaloniki, was a 15th-century Ottoman fortification, built to replace an earlier Byzantine fortress. Only 75 visitors are allowed in at one time. Even if you aren't a history buff, it's worth the climb to the top (34 meters—about 10 stories) for the views. Others, like the Byzantine Baths, are found in hidden corners of residential districts. The baths were built around 1300 and, remarkably, were fully functional for almost seven centuries—until 1940. The whole of Thessaloniki is UNESCO listed as an Open Museum of Early Christian and Byzantine Art. There are 15 different buildings, sites, and monuments in the listing that covers the transition from Roman through early Christian times to the Ottoman occupation. You can follow the trail of the Paleochristian and Byzantine Monuments of Thessaloniki but if that seems like too much hard work, at least visit The Rotunda, a remarkable building that has survived earthquakes and empires and has fragmentary remains of beautiful early mosaics. The Rotunda, along with the Arch of Galerius nearby, started life as part of a Roman Emperor Galerius's 4th-century imperial palace. Emperor Constantine had it consecrated as a church. It remained a church for 1,200 years until Thessaloniki fell to the Ottoman Empire. In the 16th century, it became the Mosque of Suleyman Hortaji Effendi and it still has the minaret—the only one in the city—that was added then. Finally, in 1912, when the Ottoman Turks were expelled from Greece, the Rotunda was reconsecrated as a Greek Orthodox Church. Today, it is formally known as the Church of Agios Georgios but most people refer to it simply as the Rotunda. A huge and impressive example of late Roman architecture, it is a must visit site.